New York, NY July 1, 2005 ONeil Gray PKA Septakhan, CEO of Icy Cold Records II and Janhoi Cole, Founder and CEO of Icy Cold Entertainment, announce today the Street Date Release of the long awaited Tsunami (Icy Cold Records II) CD Album, which will be distributed worldwide by K.E.S. Distribution from July 19, 2005. In the vein of classic Jamaican Dancehall with a Black Eyed Peas and Gwen Stefani feel, the Tsunami CD is set to be a summer smash. Septakahn, son of reggae royaltys Judy Mowatt and featuring Shema [ Yeshemabeth], daughter of reggae superstar icon Freddie McGregor. 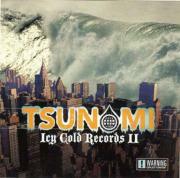 The Tsunami CD also features up coming reggae star Hawkman, and dancehall star Vybez Cartel, together with Cecile, Chino [son of Freddie McGregor], T.O.K, Yammi Bolo, Major Damage, Danny English and others. The Tsunami CD will receive full market coverage with video and radio promotions, P.O.P, In-Store promotions and worldwide tour, together with college tour, through a deal inked with K.E.S. Distributions independent music and video resource support team NMAP [National Marketing Advertising & Promotion, LLC]. T he K.E.S. distribution network stretches to over 80,000 retail outlets across the USA , and key overseas markets. With a vast distribution network that consists of such major chains such as Tower, Wherehouse , Virgin, Blockbuster, Wal-Mart, K-mart, Fye , and Barnes & Nobles, to name a few. K.E.S. also provides products to drug & food chains & (AAFES) Military outlets. Fully versed in what it takes to create a hit tune; ONeil Gray, was born into reggae royalty, being the oldest son of reggae icon Judy Mowatt, who is best known for her solo work Black Woman, Working Wonders, and Love is Overdue amongst others, as well as being a member of Bob Marleys highly regarded backing group I-Threes together with Rita Marley and Marcia Griffiths. Grays father Junior Gray was a giant in the industry, being the producer for such artist as Byron Lee and the Dragonaires, the Ska and Soca legend, as well as Dennis Brown, Cynthia Schloss, Boris Gardner and Arrow to name a few. Icy Cold Entertainment founder, Janhoi Cole is also blessed with reggaes royal blood lineage, being the younger brother of Gray; he is also the youngest son of Judy Mowatt, his father being Alan Skills Cole, who was Bob Marleys business manger and personal friend. His astute business acumen dreamt up the Icy Cold concept, and he is currently investing in the artist Hawkman with the intention of releasing the album Fulfillment later this year on his Icy Cold Records I label. Beulan and Judy Mowatt Live amongst others. Visit: http://icycoldentertainment.com for biographies and further information .